As corporate DB2 databases continue to grow, and companies strive to provide 24/7 data availability to their customers and business partners, far less time is available to run required batch processes each evening. The Batch Healthcare Solution from SoftBase provides a far more cost-effective and reliable solution to shorten your batch run times than purchasing expensive CPU upgrades. SoftBase's Batch Analyzer Facility allows companies to quickly diagnose and treat a wide variety of health problems that eat up excessive CPU cycles and contribute to production job failures and expensive CPU upgrades. In the event production DB2® jobs do fail, SoftBase's Checkpoint Facility will allow you to restart and complete these jobs as quickly as possible. 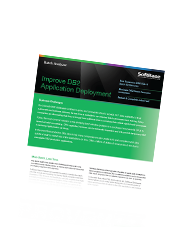 SoftBase's Attach Facility enhances the batch DB2® environment by eliminating the use of TSO and by providing many features that enhance the batch DB2 environment. Attach Facility's Patent-Pending MRF feature enables applications to take advantage of multi-row FETCH without source code changes. SoftBase's DeadLock Advisor identifies the source of deadlock timeouts and resource unavailable conditions and presents that information in the offending and offended batch job’s log. Large companies have hundreds or even thousands of jobs that need to execute every night. These long running programs often cause batch windows to shrink or even disappear. DB2 production databases are steadily growing in size over time. The more DB2 data that needs to be processed each evening, the longer the required nightly batch jobs take to complete. Many companies lack the ability to determine why their batch DB2 jobs are running longer. They are unable to find the key SQL statements that are extending their batch window and where they are encountering contention problems. Batch Analyzer captures key performance data each time batch programs attach to DB2. The overhead to collect this performance data is less than 1% overhead per DB2 job. When large DB2 batch jobs fail, the best remedy is to restart the application at the point of failure - not to wait for long, time-consuming DB2 Rollbacks and to then rerun the program from the beginning. Checkpoint Facility allows you to quickly restart any abended production job from the point of failure. Batch Analyzer locates dangerous batch jobs that will cause costly Rollbacks and allows you to complete any batch jobs that fail fast! Batch Analyzer provides many valuable reports on SQL performance, contention problems (-911s & -913s), and many other DB2 batch health problems. Also, our Batch Analyzer Contention Manager and Checkpoint Facility solution allows you to ensure if a DB2 batch job fails, you can get it completed just as quickly as possible. By eliminating the use of TSO, Attach Facility saves storage resources and improves the batch DB2 environment. DBAs and developers can quickly identify the cause of deadlocks by examining the job log of the affected application. DeadLock Advisor places a message in the job log of every batch job that experiences a deadlock timeout or resource unavailable condition.